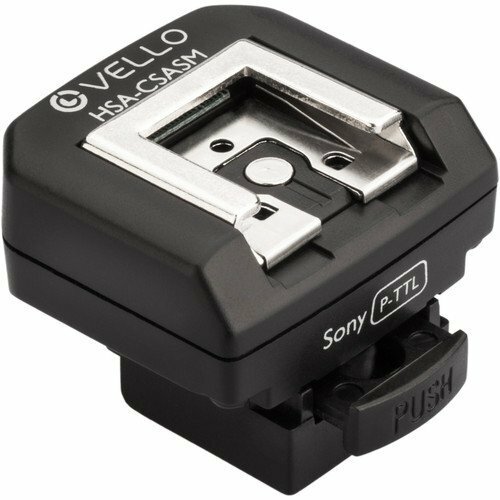 Mount the latest model flashes on the hot shoes of older Sony/Minolta cameras with the HSA-CSASM Sony/Minolta to Sony Multi-Interface Shoe Adapter from Vello. This adapter provides full support for Sony's ADI/P-TTL metering system to ensure complete flash functionality. Photographers will appreciate the compact size, lightweight, and sturdy build quality of this adapter. Well-designed, the HSA-CSASM features an auto-lock base for a secure connection. The adapter is compatible with all cameras that have the older Sony/Minolta hot shoe. View More In Shoe Mounts. If you have any questions about this product by Vello, contact us by completing and submitting the form below. If you are looking for a specif part number, please include it with your message.